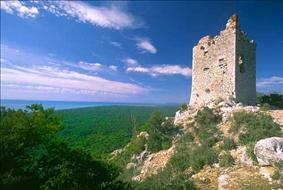 The coastal stretch of Tuscany Maremma going from Principina a Mare to Talamone and limited partly in the east by via Aurelia, has become since 1975 Maremma Natural Park. It extends for about 100 square kilometers - except for the outside stretch - and borders in the south and S/W with the sea, facing it in the southern part with a high coast subject to erosion. This kind of coast is followed in the north by beaches where the vegetal covering consists of several pioneer species which can adapt to the difficult sandy and brackish environment and which are replaced by typical species of the Mediterranean maquis as you leave from the shoreline. The coastline has been subject to deep changes not only during the geological periods, but also during the last decades: it advanced in the south of Marina di Alberese, while it considerably withdrew on the one and on the other side of Bocca d'Ombrone. From a naturalistic point of view, the complex formed by Uccellina Mountains, the pinewood of Marina di Alberese, the mouth of the river Ombrone, and the Paludi della Trappola represents a precious mosaic of ecosystems shaped by man in different periods and ways, characterizing the landscape without degrading it. There is a plain covered by Paludi della Trappola: that is a system of stretches of water, partly seasonal and partly permanent (the so-called "chiari" or "bozzi") alternating with not very evident dunes. A typical feature of this Park area is the presence of Maremma cattle bred in a wild state all year round. The inland waters house several migratory aquatic birds during the winter, but other avifauna species live here all year round. The farthest lands from the see have been subject to reclamation activities, and are now covered by agricultural fields and modern zootechnical breedings. The territory described forms part of the delta of Ombrone, a stretch of which cuts with meanders the Park territory. On the left of the mouth of the river Ombrone there is a territory characterized by a compact system of dunes alternating with marshy grounds of limited size and mainly covered with a pinewood. The Stone Pine wood is separated from the sea by a strip of Maritime Pines having the function to protect the territory from the harmful action of the salty winds. This area is crossed by some artificial canals dating back to the 18th-century first land reclamations. The central and southern Park areas are dominated by Monti dell'Uccellina, that is a system of mountains, partly of calcareous nature and partly siliceous, reaching the 417 meters of Poggio Lecci. These mountains are today almost completely covered with a thick forest vegetation (Mediterranean maquis). Only the lower part of the slopes has been deforested and transformed into olive grove or pasture. On Uccellina Mountains there are ancient religious towers and buildings witnessing the past human presence and activity in the area: the Abbey of San Rabano - which is very damaged - and the towers of Castelmarino, Collelungo, Cala di Forno, and Bella Marsilia. The human history is not only reminded by the medieval remains: in Talamone there are the remains of a Roman villa, while in the caves forming at the foot of the calcareous cliffs some prehistorical evidences dating back to the Paleolithic period have been found.